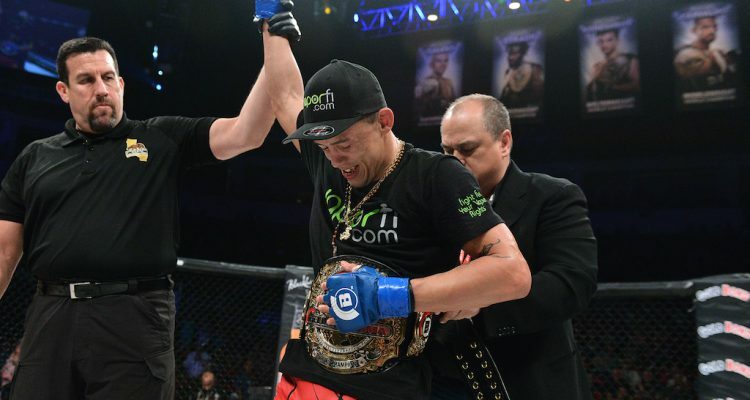 Bellator MMA Has A New Bantamweight Champion (photos) » MMA H.E.A.T. It was a rematch over three years in the making, it was a fight that was scheduled, cancelled and re-scheduled, and on Friday at “Bellator 156” inside Save Mart Center, Marcos Galvao (17-7-1) versus Eduardo Dantas (18-4) was also a barnburner of a main event with the Bellator MMA Bantamweight Championship on the line. Galvao, 33, walked into the arena with the belt in tow, riding high on his memorable victory at the expense of Joe Warren in 2015. But over the course of 25 minutes, Dantas put a halt to any momentum “Loro” had, peppering his former training partner’s left-eye with punches, until it swelled shut. Galvao tried valiantly to slow the pace of “Dudu” through grappling, but the 27-year-old did enough to earn the nod from the California State Athletic Commission judges and take back the belt that he claimed was his all along. With the defeat, Galvao’s four-fight winning streak was snapped, while Dantas has now pieced together two consecutive victories. The Nova Uniao product will now set his sights on the winner of Darrion Caldwell against Joe Taimanglo at “Bellator 159,” a bout that will determine the new No. 1 contender for Dantas’ freshly won title. Throughout the lead up to Friday’s event in Fresno, Brandon Halsey (9-2) made it clear that fans watching would see a new and improved “Bull,” and while the former Fresno State Bulldog did demonstrate a new array of striking, it was John Salter (12-3) who stole the show. The 31-year-old Wilmington, N.C. resident caught Halsey on the mat with a triangle choke submission, forcing him to tap out after 4:03 in the first round. Keeping with the trend of his career thus far, every fight Salter has won has been via submission, furthering his claim for a shot at the promotion’s 185-pound belt. In the opening main card contest of “Bellator 156: Galvao vs. Dantas,” Fresno’s own Chris Honeycutt (8-1) welcomed Mikkel Parlo (13-3) back to the Bellator MMA cage with a complete 15-minute performance, building upon the wrestling pedigree he’s known for with a newfound dynamic striking arsenal. Usually Parlo, a Danish fighter who had not competed for the Scott Coker-led promotion since 2014, gets the better of his opponents when the fight stays upright, but on Friday, it was “The Cutt” who got the better of the punching exchanges. In the end, it was the 27-year-old Honeycutt who walked away with a unanimous decision, pushing out his current winning streak to two bouts and improving to 4-1 under the Bellator umbrella. No Comments on "Bellator MMA Has A New Bantamweight Champion (photos)"